Why HIGHWAY66 is good for you? Highway66 is the most popular and best-selling mini bowling attraction in the world. In fact, it’s so popular that it truly defines the category. Since the introduction of mini bowling over 20 years ago, more than 3,000 Highway66 lanes have been installed worldwide. Highway66 is infused with QubicaAMF’s rich heritage of traditional bowling expertise, and the ultimate expression of our superiority in manufacturing and innovation. It is the only product of its kind designed by the one global bowling equipment manufacturer committed to stay in the industry. And, it’s proudly made in the U.S.A., a premium production choice essential to ensure top quality and reliability that are trademarks of Highway66. Not all attractions in today’s entertainment landscape are equal. Some have less impact on your guests. 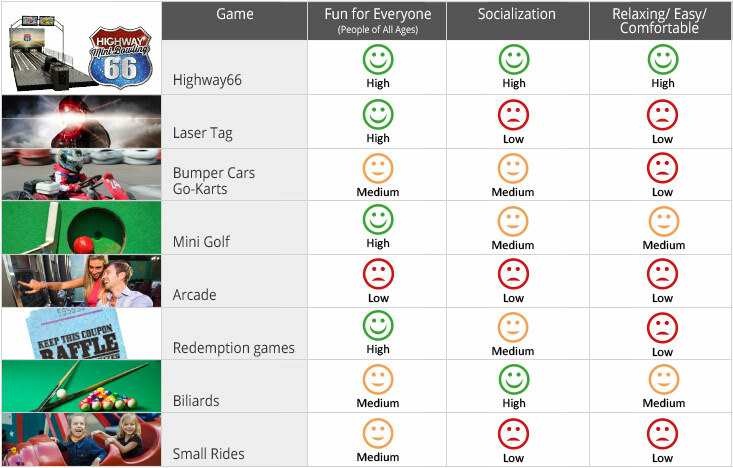 Some are better in terms of being fun for all ages, for socialization or ease of use. Only the new Highway66 delivers on all of these elements at the same time.